Small is the name of the game with the Zeiss Victory Compact binocular. It is among the smallest of pocket binoculars. The 8x20 model is only 4 inches long and weighs only 7.9 ounces. You don't even remember you're carrying it -- until you see a bird and remember the purpose of your life. Outstanding optics provide sharp views. In daylight it is nice and bright. At dusk, you lose some brightness compared to a full-sized binocular, with it larger, 42mm objective lens. It focuses as close as 10 feet. It's waterproof, nitrogen purged to prevent internal fogging. The non-slip rubberized surface feels nice to the hand. I prefer the smaller 8x20 model, but there is also a 10-power model available, shown at right. The 10x25 model has a larger, 25mm objective lens, in order to maintain the same exit pupil of 2.5mm that you get in the 8x20 model. The 10x25 is a 3/4 inch longer and weighs 8.8 ounces, which is a little more than its smaller brother. More significantly, the 10x25 focuses only down to 13.1 feet. 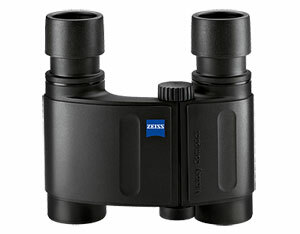 For both the 8x20 and the 10x25 Zeiss Victory Compact, the design is asymmetrical. The hinge is left of center. That lets you nestle the left barrel into the hollow of the bridge, against the right barrel. As a result of the asymmetrical design, the focus knob is also off center, making it more comfortable to reach with your right index finger than with your left. This arrangement may be helpful to people whose hands find most compact binoculars too tiny to hold comfortably, as it makes a little longer reach for the focusing finger. If your eyes are close set so that some binoculars won't let you see through both barrels at the same time, the Zeiss Victory Compact may be your solution. The folding design provides for an interpupillary distance that would work even for a small child, as well as for an adult with whose eyes are closer together than average. I wish this compact binocular had a little longer eye relief. At 14mm, it might not work well for everyone who wears glasses. When I wore glasses, I found I could make do with the Zeiss Victory Compact, but it is really better for a person without glasses. 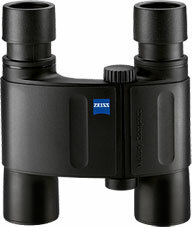 Zeiss offers the same proprietary coatings on the Victory Compact as it does on its full-sized Victory SF binoculars.